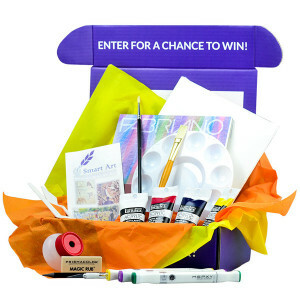 I had the opportunity to review a new service for artists called the Smart Art Box. If you’ve watched many youtbe videos, I’m sure you’ve seen the gamer, beauty, and even pet boxes that are available. These services send you a box full of little surprises each month for a monthly subscription fee. Well, now there is finally one for us!! The guys over at Smart Art Box sent me a free box to review for you guys. **Note: I am not being paid for this review, these are my honest opinions** I was pretty impressed with the supplies they sent. These aren’t little sample sizes that I would expect in something like this. They also aren’t cheap supplies. The box that I got came with a set of 12 Derwent Inktense blocks, a Faber-Castell water soluble graphite pencil, an 8×10 ampersand paint board, and a neptune paint brush. It also came with a really nicely printed brochure of sorts that give you a bit of a history lesson on the artist that developed the style we were learning about in this month’s box, a full description of each of the supplies included, and then complete instructions on how to do the project yourself. Given that I have never worked with the Derwent Inktense colors before I had NO idea what I was doing and was a bit intimidated by them. They are similar to watercolor which is not a medium I work in. The instructions, however, were complete enough that I didn’t feel totally lost. I was able complete my still life and got far better results than I expected when trying something new like this. Not only was I working in a new medium, but a different style altogether which I found to be a fun change from my usual. The thing that makes this concept of getting a new lesson plan and new supplies so great is that it lets you test out supplies that you may have been intimidated to try out on your own. How many times have you seen supplies at the art store but didn’t know what they were for or how to use them? In the case of this box, I now know what type of paper/board works well for these pencils, the type of brush to use, and how great a water soluble pencil is. I’m SO going to be buying more of those! For me, I have heard people talk about inktense pencils and colorblocks for a while, but I had NO idea how they worked or how to layer them so I wasn’t sure I wanted to spend the money on a set. After playing with these, and following the included lesson I now have the answers to those questions. For anyone wondering, I will probably be purchasing a full set in the near future, so you can expect to see a full review on them soon! How much does it cost? Can’t I just go buy the supplies myself? The cost of each box is $50. They do have discounts though, so you can save 10% on that subscription. While you can buy all of these supplies yourself, I think given the lesson plan that explains how to use the project step by step, the box really is a good value. For my 2 hour art lessons I charge $20, and students have to have their own supplies. This box includes both.